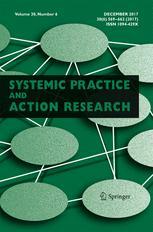 Triple Task (TT) is a unique form of participatory action research in the sense that not only does it attempt to arrive at answers to research questions but also tries to understand what factors may have been at play in arriving at those answers. This attribute makes TT an advance on many other participatory techniques which are more focussed on delivering outputs (representing an apparent ‘consensus’) and less concerned (if at all) on the dynamic behind that ‘consensus’ and how the process may have influenced what was produced. 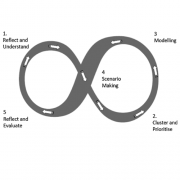 Participatory research takes many forms but the underlying philosophy is that all those involved—be they ‘researcher’ or ‘researched’—are involved in the design of a research process as well as the interpretation of findings. Power should be shared rather than being concentrated in the hands of a researcher. As a result the very process of doing the research can provide many insights and help bring about positive change. Hence the term ‘action research’; a research process that catalyses action. Beginning with the question, can a multimethodology explore the nature of group work from both the inside out (group participant self-analysis) and the outside in (facilitator observed analysis), this study presents the results of a statistical analysis comparing 2 different approaches to assessing group function: SYMLOG (A SYstem for the Mul- tiple Level Observation of Groups) and BECM (Being, Engaging, Contextualizing and Managing). SYMLOG is a quantitative internal assessment of group function made by members of the group, whereas BECM is a qualitative external assessment made by an outsider observing the groups. Together, it is argued, they provide a unique, triangu- lated assessment of the group dynamic. By using a “best subsets” linear regression technique it was found that some of the 26 characteristics of SYMLOG are related to BECM scoring (adjusted R2 0.82). This article discusses the reasons for this and the repercussions for such blending of approaches to understanding group dynamic. The article ends by discussing the relative advantages and disadvantages of the 2 ap- proaches and potential for further hybridizing of them in blended group dynamic approaches. This paper concerns the interpretation of pictures that stakeholders draw in order to help them structure and understand complex situations. The pictures in question are called Rich Pictures (RPs) and the matter at the heart of interpretation is insight drawn from eduction (drawing forth). Insights relate to stakeholders of all kinds, be they the individual, the group, the context in which the individual and the group find themselves, or the means whereby the context can be made more sustainable or improved. RP drawing, often as a collaborative, stakeholder exercise, is a powerful activity that has the capacity to break down barriers of lan- guage, education and culture. 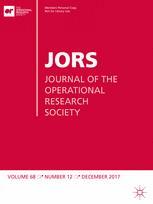 Drawing upon research with RPs from around the world and spanning 50 years of our combined practice, this paper demonstrates RPs’ utility, universal- ity and resilience. We maintain that RP drawing enriches problem solving and, in the long term, saves time and resources being expended on erroneous and/or superficial tasks. However, the interpretation of RPs is still in its infancy. By use of processes derived from various forms of content analysis (CA) we argue that RPs can be applied as a powerful tool in a variety of policy fields. Conclusions for application are drawn and suggestions are made for further research relating to the clearer interpretation of RPs. understandings to be shared later. This is an ‘outside in’ review of the group dynamic. 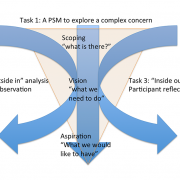 In effect, it is the facilitators assessment of the group process using a matrix approach originally developed at the Open University and known as BECM. Is the ‘inside out’ review of the group dynamic – the stakeholders’ assessment of their group process. The three tasks align in providing a unique ‘group signature’ which can be compared and contrasted to the unique signatures of other groups or benchmark signatures. At the end of a TTM intervention a group will have gained clarity about its task and the organisation will have a deeper knowledge of how well groups are functioning. Organisations and individuals suffer from fear – probably more than they like to admit. Numerous decisions are made based on underlying fears and anxieties but how can we map out and gain power over fearful things? 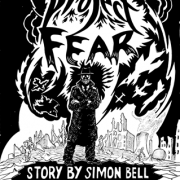 There are a host of books about fear but, there has been little attempt to methodically and systemically assess how fear emerges and is targeted. In exploring the Formations of Terror or FoT participants set about the methodical assessment of fear as an emergent property. Working from personal experience of fear and teaching by use of examples and case studies, the FoT method will derive the main principles which lie behind the manifestation of fear of all kinds. Using climate change as a specific point of focus, fear is seen to be a major force in problem assessment and analysis and, by accident or intention, a significant confusion to human decision making. By studying the FoT, participants will gain a systemic assessment of the main features of the Paradigm of Fear. Furthermore, they will be able to identify Fear Amplifying and Fear Attenuating systems and learn how fear can be contained, how new social forms can arise and how new behaviours and social qualities can mitigate the Formations of Terror. Find out how fear is weaponised and targeted and how to avoid making things worse! 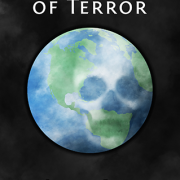 This comic an easy access point to understand the Formations of Terror.